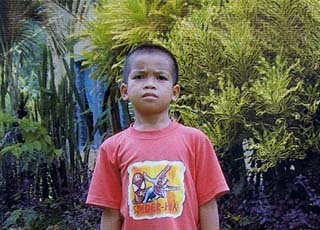 He was barely two years old when his parents separated. 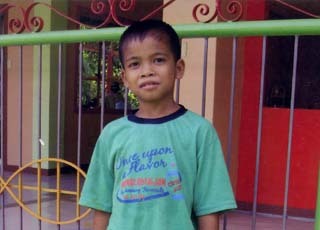 He was left at the care of a relative in Cebu City. Since his guardian lives in one of the squatter areas, He at a young age lived the life on the streets. He begged for food , and many times the neighbors complained because the child , along with his friends , store their merchandise. He came frome a troblued family. His father is drug-dependent and currently in jail. His mother survived by selling herself to other man. His older brother lived with their grandmother in Bohol , adjacent island to Cebu. 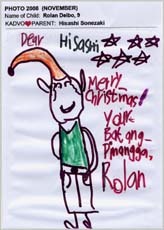 Christmas 2006 , his older brother arrived for a vacation but after that his brother refused to go back to Bohol. Since then the brothers together scanned the streets for some scraps to sell. At night they slept on empty trisikads(bicycle-driven carts carrying passengers). On some days when they are hungry the brothers and their friends would stole coins from parked passenger jeepneys. A local committee on children saw their situation and brought he and his brother He for shelter. 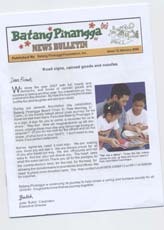 They arrived in Batang Pinangga on March 6 , 2008.